Feel like playing a game of chess but don't have anybody to sit across from you? This web-connected robotic chessboard with artificial intelligence can help. If you’ve ever seen the movie Harry Potter, then you’re probably familiar with Wizard’s Chess; the game where the pieces on the chessboard move on their own. While the game in the movie was powered by magic, modern technology (which might as well be magic) is making it possible for anyone to enjoy a similar experience in the real world. And you don’t even need to buy a robot companion. Square Off is a chessboard that enables anyone to challenge anyone in the world from the comfort of their homes. The robotic/magnetic chessboard and chess pieces are designed to move without any human intervention, either guided by a remote player moving pieces on their Square Off board, or by the artificial intelligence built into the unit. Square Off Mode: Users can challenge any person anywhere—board vs board or board vs app. Regardless of play mode, the chess pieces still move on their own to reflect the moves of the opponent. Training Mode: Users can play against the artificial intelligence of the board, with 20 different difficulty levels. Live Streaming Mode: Viewers can tune into any match, worldwide. They also have the option to record the matches and replay them anywhere they want. Modes, details, challenges and just about everything but the movement of the pieces (to avoid the aesthetic compromise of having buttons all over the board) is controlled through the Square Off app, available for both Android and iOs. Under the hood / board Square Off uses a compact two-axis robotic arm with a magnetic head to move the chess pieces. There’s an AtMega 2560 chip equipped with Bluetooth LTE connectivity that makes it possible to connect to smartphones. Between the physical and digital design, there is intelligence baked in to ensure that the chess pieces don’t collide during automatic movements. Apparently, the adjustable magnets even make it possible for players to use Square Off in outer space—HEY, IT GETS BORING OUT THERE. All that’s required is that the magnetic strength be turned up accordingly. In this merge between the conveniently digital and the classically analog, looks were not spared: the board is spill-resistant and the pieces are handcrafted. The board batter supports up to 10 long games with about 40 automated moves per game. There are two sizes: the small board is 486mm x 486mm x 75mm while the larger version is 621mm x 486mm x 75mm. It’s only after three years of intensive research that this technology became ready to hit the market. After presenting at numerous events and exhibitions, Square Off has won multiple awards including the Editors Choice at the World Maker Faire in New York and Maker of Merit in Maker Faire Rome. 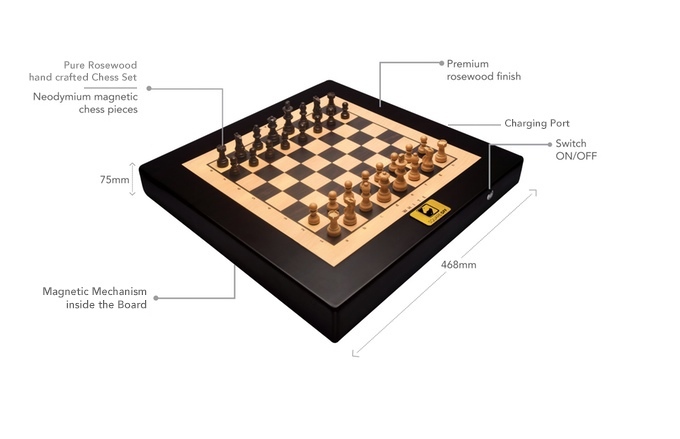 Pricing for the board starts at €179 and this includes a Square Off board, Rosewood chess pieces, a power adapter, phone stand, LiPo battery, and the Square Off app. To date the company has raised over €100,000 via Kickstarter; their original goal was just €45,000 and they have about three weeks remaining in the campaign. The estimated shipping date is April 2017. Your move, backers. What a great product! Changing up an age old game like chess and honestly, that price is not bad at all! I like the fact that the pieces on the chessboard do not touch others as they move around. that is some real cool technology right there! Having the ability to play other people without them being right beside you adds a certain social aspect to the game, which is nice. Totally awesome. I know at least one chess club that would LOVE a board like this and access to playing others in another country! Incredible. An industry that really has gone unchanged since talking game boards were invented. I love it. There are a lot of chess players out there as well. This is going to take off very quickly! These kids seem really excited to see something more modern for a game they really like.